Nathan Myhrvold and Intellectual Ventures Lab have invented the machine that can kill mosquitoes with lasers beans. This mosquito death ray was built in-house from parts purchased on eBay. The lasers recognize and track the flying insects, measuring the frequency of the wing-beats to determine their gender. 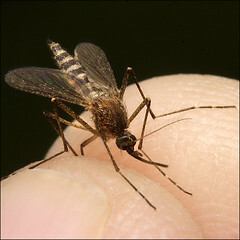 Females are targeted specifically and zapped to prevent them from taking blood meals and breeding more mosquitoes. Eric Johanson (from Intellectual Ventures) explains us how the system works in the following video below. In that demo green laser pointers are being used instead of killing lasers for safety reasons. hi how are you? alan carrillo am living in Merida Yucatan, Mexico and am very interested in the laser to eliminate mosquitoes, agricultural work and need the laser to take care of my culture. how much does it cost?